Hello all! Hope you've had a great week. 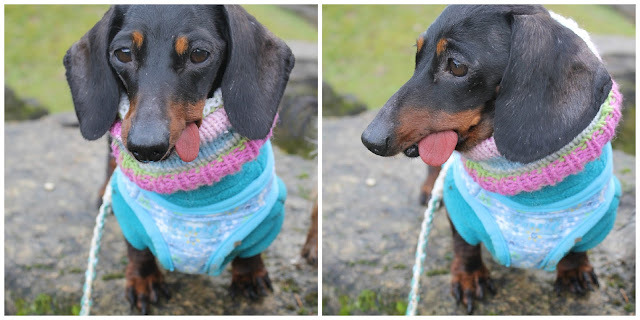 Anyone who owns a dachshund will know that they really feel the cold; even in this milder weather, Winnie still needs to be wrapped up warm for muddy walkies, and she's always got a jumper or coat on. However, now we can keep her even more snug! This fabulous snood from Harry Dachshund Crafts on Etsy is the perfect addition to Winnie's winter wardrobe. As an etsy shop owner myself (you can find my shop here, we currently have a flash sale on all our bandanas!) I think it's really important to support and promote other small sellers... especially those who painstakingly hand-make their products! These snoods really are beautifully made, and it's the perfect thing to keep Winnie's neck nice and warm. As you can see from the photos she's a bit of a baldy; there's nothing wrong with her, she's just middle aged and didn't have the best diet in her previous home, so she's been left with some hair loss. If you follow me on Twitter you'll have seen that you can also pull the snood up over the dog's head to keep their ears warm. This would have been absolutely fab in the frosty weather we saw recently! She also wears it like that around the house on cold mornings, bless her. A quick little post from us today, but I just had to share these photos with you! Would you buy a snood for your dog? We're hoping to get our mitts on a few more!